This quote speaks directly to why I chose long ago to finish obtaining my Bachelor's degree. I joined the United Sates Air Force directly out of high school in the late 80's. Upon leaving the military in the early 90's, there weren't many job opportunities back then for minorities without college degrees. Although, I did find work, I felt I was not maximizing my potential, so I decided to go to college; I took my first college course in 1991. I was unsure as to what field I wanted to pursue, however, most all the degree requirements involved a set of core classes. Ultimately, I was fortunate to have left the physical, heavy labor jobs behind, and went into a sales career. I was very successful monetarily in sales, however, I was still unfulfilled personally, and quite frankly, most of the major career positions in sales require an advanced degree, which I had not yet earned. Over the years, I had continued to take college classes, some in the different states I had previously lived, but much of my college coursework was completed right here in North Carolina. 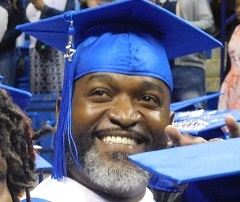 I earned my Associates degree at the junior college level several years ago, however, I told myself that I would not stop until I earned my Bachelor's degree. I chose FSU because it allowed me the ability to combine on campus learning with online learning, since I needed flexibility in my school schedule due to work and family obligations. I also chose FSU because it is a Historically Black College that has a rich history, going into its 151st year. Although, I started in the Business and Marketing program, and completed much of that curriculum's coursework, I decided to reassess other majors, and after speaking with the Director of the Professional Studies program, Dr. DeLone, I had realized that the Professional Studies major provided me the recognizable skills and recognizable coursework that one needs to be successful in the world of business, and many other careers. The best part, I had already completed many of the curriculum requirements to earn a Bachelors degree, due to the magnitude of college coursework I completed over the years at different colleges, and which were transferable to FSU and the Professional Studies program major. As an adult learner, we are tasked with the responsibilities of taking care of family, job responsibilities, having minimal time flexibility, and a host of other obligations. FSU allowed me the opportunity to complete my Bachelor's degree in Professional Studies, at my own pace, and at a cost that I could afford, which opened doors that were previously closed; since recently graduating, I did earn that elusive corporate sales position that I could not have attained without a degree, and the best part, my comfortable salary increased even further, and I have fun. My advice for anyone seeking to become the best of themselves by extending their education, which will allow closed doors to open, always remember the three D's of success, Desire, Dedication, and Determination. One must desire a goal, one must remain dedicated to that goal, and most importantly, one must never let anyone, or anything stop you from being determined to reach that goal, not even time, because its never to late to accomplish anything. The Professional Studies program at Fayetteville State University will help you achieve your goals. Bronco Pride!